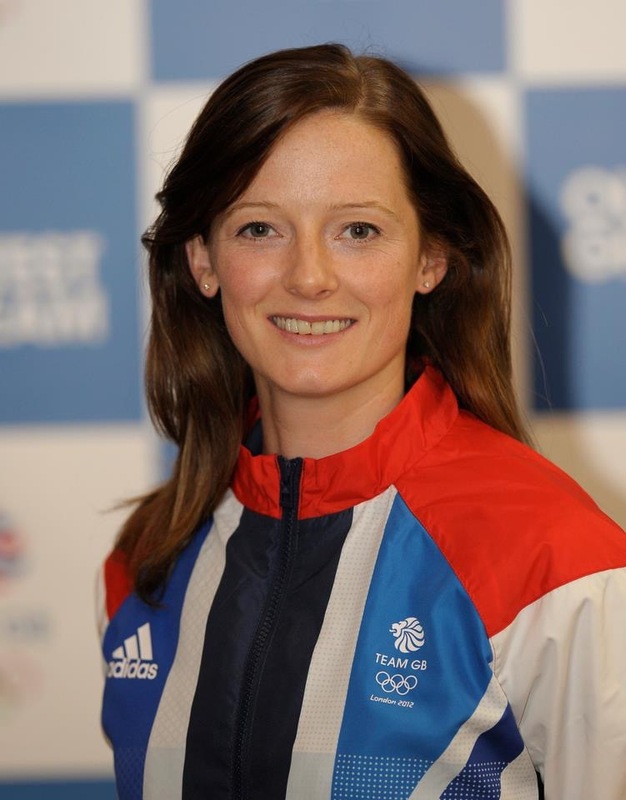 Helen Richardson-Walsh is a professional sportswoman and has played hockey for the Great Britain women’s team since the late 1990s. She won a gold medal at the 2016 Olympics. Her involvement with the team led to an interest in psychology and this prompted Helen to study towards an OU degree in the subject. Helen admits that degree study has taken her out of her comfort zone at times, but she has no doubt that having a degree has made her more employable. Helen has found her studies so inspiring that she is considering further research at some point in the future. “Before embarking on my OU degree I was a full-time athlete, training for the London Olympics. Due to the level of funding we received from UK Sport via the National Lottery, I also did some part-time work – mainly coaching and going into schools to give presentations – but my focus was always on hockey. I’d started a degree in human biology at Aston University back in 2000, but I lasted just a term. This was partly because it wasn’t the right course for me and partly because it was straight after the Sydney Olympics, so my attention was elsewhere. 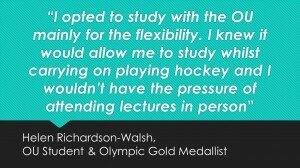 When the time was right, I opted to study with the OU mainly for the flexibility. 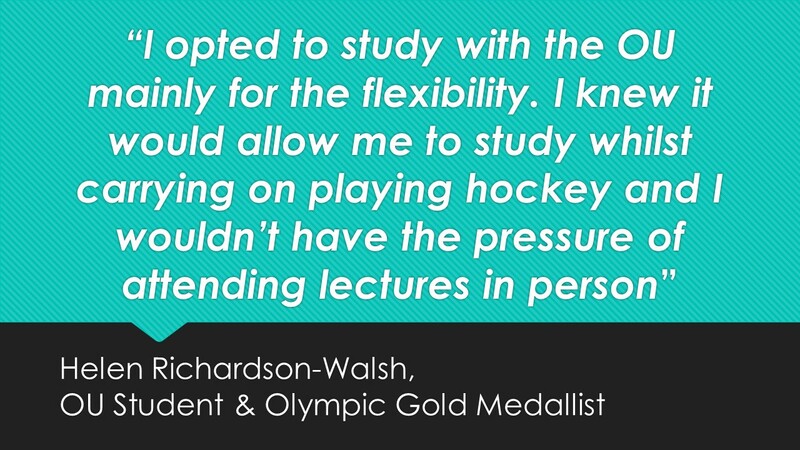 I knew it would allow me to study whilst carrying on playing hockey and I wouldn’t have the pressure of attending lectures in person. I’d also be able to start modules when I wanted, so would only sign up when I knew I could get the studying done; for example, I chose not to start a module in the summer of 2012 so that I didn’t have any assignments to complete during the Olympics. 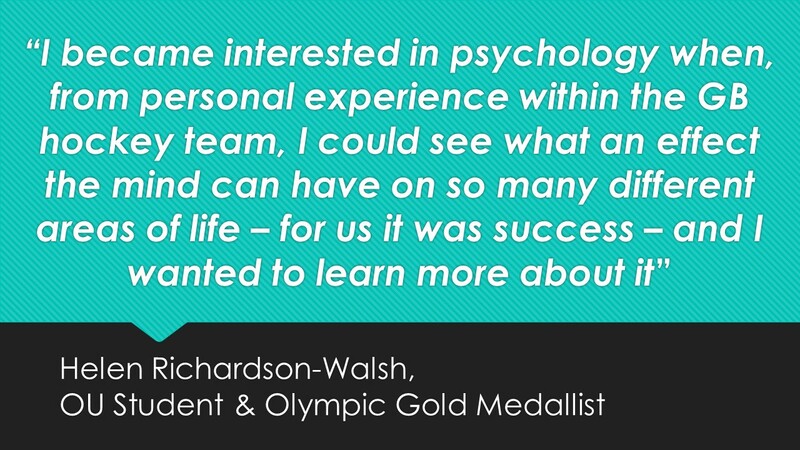 I became interested in psychology when, from personal experience within the GB hockey team, I could see what an effect the mind can have on so many different areas of life – for us it was success – and I wanted to learn more about it, hence my choice of degree subject. When I started, I said I’d do one module at a time and see where that took me. I’m now less than a year away from getting my degree – something I was never sure I would do – and excited at the possibilities it has opened up. 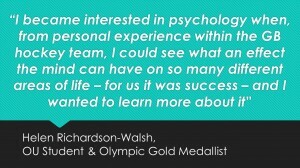 Inevitably, there have been challenges in balancing my athletics career with a degree and a personal life. The biggest challenge is doing all the reading that’s involved, because very often at the end of the day I’m so exhausted from training that it’s very hard to concentrate. The period leading up to my assignments being due is always challenging and I’ve found relief from having been granted a number of extensions. I’ve had to say no to so many invitations in the past due to playing hockey, and when I’ve got an assignment to complete it makes going out doubly impossible! My biggest achievement so far in my degree study was finishing my first assignment! Up to that point I’d never had to write an essay like that, given that my A levels were science-based (and a long time ago!) and I can still remember how hard I found it to construct the essay; it was a relief to send it off and then to find I’d passed it. I’ve really enjoyed doing more of the practical-based project work; that has been very satisfying. There are a few modules I’ve found particularly inspiring. I’ve definitely enjoyed my current module, DD307 Social psychology: critical perspectives on self and others the most. I guess it fits with the reasons why I started in the first place, so that’s no surprise really, but I also found the project we had to do really interesting. I chose to focus on retirement from international hockey, so looked at what that experience is like and how players have navigated their way through it. It certainly inspired me to consider further research as a possibility in the future. I would never have said that about myself ten years ago! My tutors – I’ve had four so far – have all been very helpful and supportive. The main thing for me has been the need for extensions, which have been no trouble in the main. I have no doubt that my degree has made me more employable. My hockey career has taught me many skills, which I hope to transfer to a different career one day; however, this degree will show a different side of me and of my abilities and may also need to be a stepping stone to further studies if I do indeed choose to go down that route. This entry was posted in Student Stories on September 6, 2016 by Caroline Heaney.